After saying I didn’t want to write about neutrinos, I wrote a 900-word analysis of the OPERA experiment that might show interesting new physics (but probably doesn’t); it turned out to be the most-read thing I’ve yet written for this blog. In other words, it’s amazing what you can accomplish with a positive attitude. (*Ahem*.) Since I run a more-or-less regular feature about basic physics concepts, it seems appropriate to step back from the particular experiment in question and ask what neutrinos are and why they’re important. Enrico Fermi (1901-1954), Italian physicist who named the neutrino. Neutrino means “little neutral one” (or “leetle a’neutral one”, spoken in your worst fake Italian accent); the particles were named by the great Italian physicist Enrico Fermi, who emigrated to the United States to escape the fascist regime in Italy. 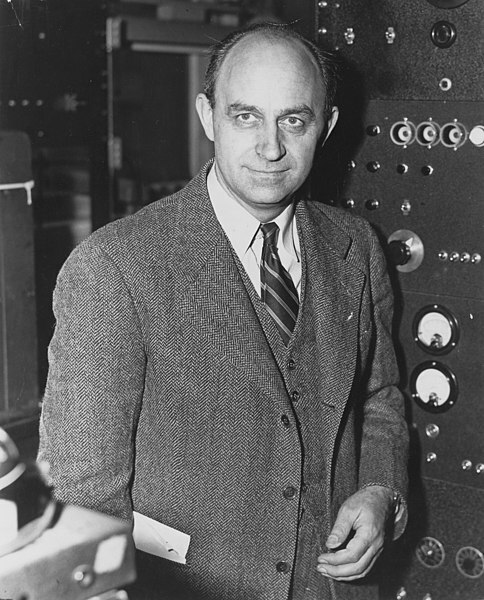 (Fermi is perhaps best known for building a reactor at the University of Chicago, at which the first nuclear chain reaction was produced, but he contributed to many areas of atomic and nuclear physics over his career. He died of stomach cancer at age 53, probably due to excessive radiation exposure.) Neutrinos were first predicted by Wolfgang Pauli in 1930 when very important physical quantities — energy, momentum, and angular momentum — didn’t add up in a variety of experiments. With such small mass, no charge, and no magnetic interaction, neutrinos are very difficult to study experimentally. They interact primarily via the weak nuclear force, which as the name suggests is weak and short-ranged: while both the gravitational and electromagnetic forces reach out throughout space, the nuclear forces act only over very small distances. This means a neutrino basically has to score a direct hit on an atomic nucleus before it makes its presence known, so researchers have to build detectors to maximize the probability of a neutrino hitting a nucleus. That’s hard! Say your living room is 5 meters (about 16 feet) across; proportionally, an atom the size of that room would have a nucleus about 1/10 of a millimeter wide (0.004 inch), the thickness of a very fine human hair. To a neutrino, the rest of that atom is so much empty space.Trillions of neutrinos pass through your body every second from the Sun alone, and most of those won’t strike a single nucleus during their passage. How the Sun makes neutrinos: two protons (p) get slammed together to create deuterium, which is hydrogen with a neutron (n) added. Since the total amount of electric charge has to be preserved, the process creates a positron (e+, the antimatter partner to electrons). 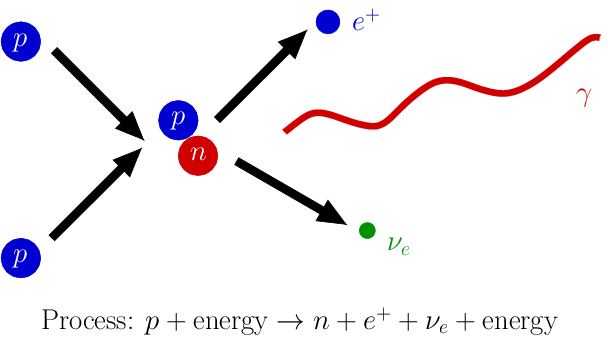 To conserve energy, momentum, and the like, an electron neutrino (νe) is also produced. The final piece is a gamma ray photon (γ), which after a long period and a lot of collisions with atoms inside the Sun loses most of its energy to become the visible light we see. All of this is simple enough, and goes a long way toward explaining why neutrinos are difficult to study experimentally. One more major complication exists, though: they come in at least three varieties, associated with the three types of charged leptons. Leptons are electrons and their heavier, less stable cousins — the muons and tauons (I think we all have family members like that). In the Standard Model of particles and interactions, one neutrino is paired with each lepton, so there are electron neutrinos, mu neutrinos, and tau neutrinos, of which the electron neutrino variety is easiest to study. The three types (or flavors) of neutrinos change into each other if they are left alone, an interesting property known as neutrino oscillation. This is because the neutrino types have slightly different masses from each other and in their natural state are a combination; in this sense they are similar to the ammonia molecule I wrote about in an earlier post. To summarize, in the case of ammonia, there are two states that are equally probable (the nitrogen atom “above” or “below” the three hydrogen atoms), so if left alone the molecule oscillates between the states rapidly. In the case of neutrinos, there are three states, but the principle is similar: a neutrino once it is produced isn’t preferentially an electron, mu, or tau neutrino, but changes from one to another, with the time of oscillation dictated by the difference in masses between the flavors. (Have I pointed out yet how many things in nature are oscillators?) Interestingly, we have a better handle on the difference in masses than what the masses actually are! The maximum mass for neutrinos, as I mentioned earlier, is very tiny; rarity of interactions means they tend to travel in straight lines at constant speed; the ways they are produced tend to give them very high speeds. Putting all this together, neutrinos travel incredibly close to the speed of light according to our standard theories: the deviation is tiny for typical neutrino energies. That’s partly why the neutrino results from OPERA are contentious: the predicted speed is so close to the speed of light that a small error in measurement would push the apparent speed over the limit. The type of neutrinos that are causing chaos at OPERA are mu neutrinos; the type detected from Supernova 1987a were electron neutrinos (well, actually electron anti-neutrinos, but the principles are close enough that we don’t have to worry about the difference here). Does this imply there is a difference in speed between neutrino types? Probably not: Ben Still goes into more detail about what that distinction might mean in terms of supernova results, and also the energy differences between various neutrino observations. I haven’t really changed my own views since last week, which makes sense: the main thing that needs to happen is more time, more thought, more data, and more analysis. The important thing to remember is to look past the sensationalist headlines shouting about “Einstein being wrong” and the overthrow of everything we know about the universe, and remember: we do know a lot about neutrinos, no matter how slippery they are. Epilogue: For those dissatisfied with my version, here are two more neutrino links. Caleb Scharf’s follow-up post at Life, Unbounded. Ethan Siegel asks if we could be fooling ourselves, since there is so much room for error. The story isn’t over yet, nor will it be for a while.